It's time to get those formals out, put on that sporty cap and enjoy this exciting Golf session. 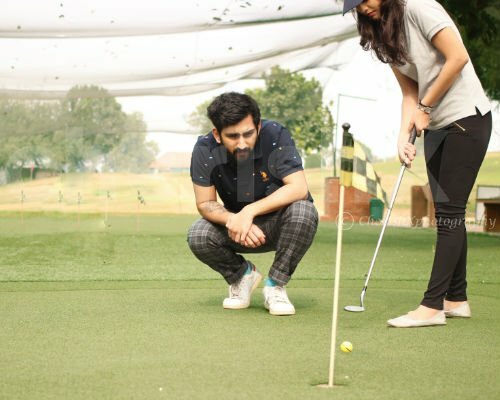 Play freestyle golf on the green plains, surrounded by green everywhere coupled with beautiful ponds for a nice experience.This amazing session includes One hour Golf lesson with a professional instructor to give you real Pro-Golf feels. You can even invite your friends and their partners or you can just enjoy a me time by pampering yourself to a Golf session. This fun Golf session will fill your mind and body with new zest. In the morning session, you can play golf listening to the melodious chirping of birds and feel the cold dew on your skin. 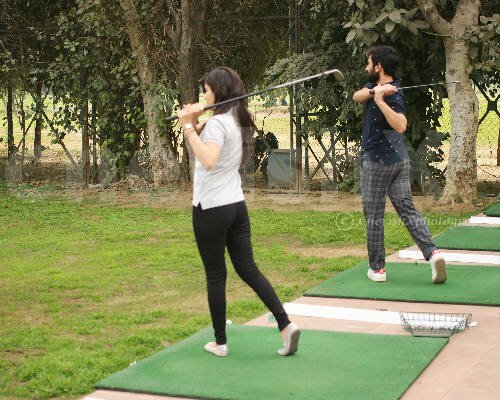 This session includes: Basket of 100 balls per person, a full day membership of driving range or you can even choose a round of 9 holes for a scenic tour of the golf course. You can even customise your experience with some amazing customizations like gift a flower bouquet to your partner or friends to turn this session into a pleasant date. A well prepared, delicious cake to eat while playing golf to increase the fun quotient. One hour golf lesson with instructor. Basket of 100 balls per person.